I am officially hooked to a new anime series. Sadly, its only 51 episodes. Its called Soul Eater. Sounds like a weird name, I know, but hear it out. The anime starts of about a school called the DWMA or Death’s Weapons and Meisters Academy. The focus of the academy is thus: To train weapon and meister pairs to combat Keishen’s who would threaten human souls. Keishens are monsters that devour human souls in the event to make them stronger and to satiate their hunger for them. The main focus of the meisters though, is to have their weapon eat 99 keishen souls and 1 witch soul, so that they may transform and become a DeathScythe used by Lord Death himself. 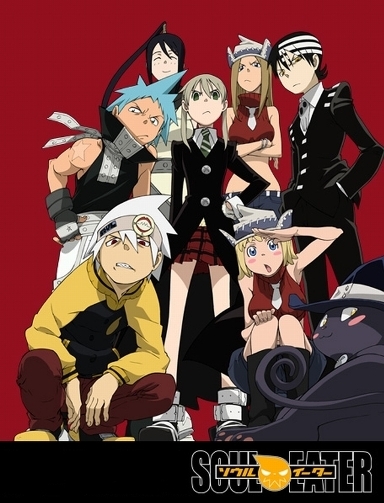 The anime follows a set of meisters, but the main pair is Maka Albarn and Soul Eater. 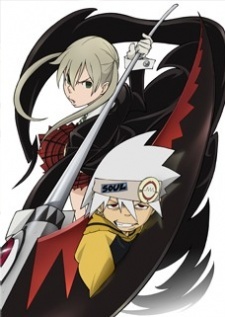 Maka, a meister, is partnered up with Soul Eater, a weapon. Now Maka is a Scythe Meister as Soul is a Scythe weapon, but their are other types of meisters too. 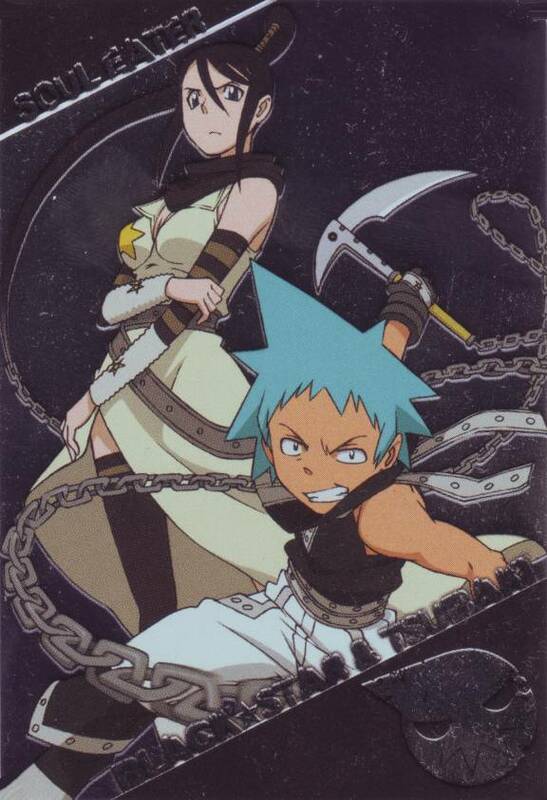 The story also focuses on the meister pair Blackstar and Tsubaki. Blackstar, a meister from a clan of assassins, has a very powerful soul wavelength, allowing him to attack with his soul directly. Tsubaki is also of a different sort since her weapon mode isn’t limited to one weapon. She is capable of transforming into chainscythes, ninja blades, smoke bombs, and eventually the enchanted sword Masamune. One other pair is Death the Kid. Death the Kid is the son of Lord Death who resides over the DWMA and Death City which surrounds it. Death the Kid is a Grim Reaper like his father but wields weapons very much like meisters do. His weapons are the Thomson sisters who turn into twin pistols. Each Meister pair has its own problems during their missions, however. As strong as their partnership may seem at times, Soul and Maka often don’t see eye to eye. Maka is a bit stubborn and governed by rules and knowledge, often leading to hesitation in battle. Soul, however, is cocky and often seen with Blackstar who has a huge ego. Despite their differences, when it comes to battle, Soul and Maka are an ferocious team. Their special attack WitchHunter, is when their souls resonate or match wavelengths and then speed them up to create a tremendous soul attack channeled through the weapon. The next pair is Blackstar and Tsubaki. Blackstar is very cocky, often stopping in the middle of battle to spout off stuff about him being the star of the show. But as cocky as he is, he sure is powerful. As meisters, you normally use a weapon to attack an enemy. Blackstar is an interesting case in that he can control his soul wavelength enough to attack with it directly, without using a weapon. Tsubaki is very timid and follows along with Blackstar, knowing all well that he will mess something up. Her ability to change weapon forms though is very useful. The third pair that is focused on is that of Death the Kid and the Thomson sisters. Death the Kid, being Lord Death’s son, is a Grim Reaper and is no ordinary meister. He does have on very big flaw… everything has to be symmetrical. Often times, thoughts of asymmetrical items leaves him paralyzed or in tears, unable to bring himself away from the asymmetrical fact. This often times is his downfall in battle, but the Thomson sisters are always their to back him up. The Thomson sisters, Liz and Patti, are his weapons, since he needs 2 to be in perfect symmetry. They are always supporting Death the Kid, no matter what asymmetrical pattern he stumbles on. Their special attack DeathCannon, transforms Liz and Patti into two arm cannons which charge up soul wavelength and unleash it in one massive blast. Spirit- Maka’s good for nothing father. He has a problem with not checking up on every pretty girl which led to a divorce with his wife. Spirit does love his daughter and wants to be a good father, but he is just too fargone in Maka’s eyes. Spirit is also a DeathScythe, one of eight that inhabit the world at the current time. He is Lord Death’s personal DeathScythe, but often teams up with his old partner Stein every now and again. Dr. Franken Stein- Recognize the name? Dr. Franken Stein is a meister with a very keen interest in dissections. Slightly mad in a way, he is no meister to be messed with. He is terribly smart, often consulted by Lord Death himself for second opinions. He used to be Spirit’s partner, til a time where Stein may have dissected part of Spirit at one point. They aren’t a very good pair personality wise, but they sure can fight well together. 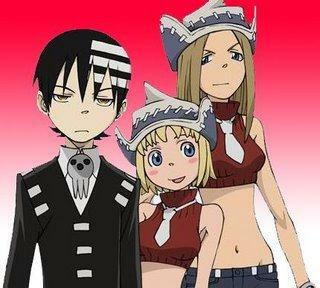 Though there are many more characters and I could go through character bios all day, I think Soul Eater should be watched, not explained to you in a blog post. So run along children, and flock to the show. Watch it, see what you think. Tell me about it, or not. The choice is yours. I watch it on Netflix, so if any of you readers, have it, you can watch it on there. Or, if you aren’t a Netflix user, never fear! Animefreak.tv always has the latest and greatest anime dubbed and subbed, whichever you prefer. Enjoy!